At Broom Lodge, we like to think we can offer typically warm Scottish hospitality to make your stay more enjoyable. 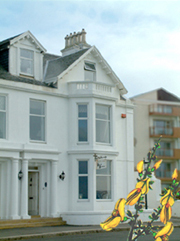 We are conveniently located on the seafront of Largs, Ayrshire, in the south-west of Scotland, and can offer a variety of comfortable rooms to suit your needs. The rooms are all fully equipped and most have en suite facilities for your convenience. "The town centre of Largs is a short stroll away offering an interesting shopping experience and the Cumbrae islands are a short ferry ride away from here. There are also excellent links to the city of Glasgow which boasts some of Europe's premier shopping sites and an interesting selection of museums and art galleries. "We're also very well located for those wishing to travel further north with good road, rail and bus connections available. Of course there's plenty to keep you fully occupied here in Ayrshire itself. Locally, there are some excellent golf courses for that seaside links experience, the Largs Yacht Haven is just down the road for those into sailing, Kelburn Country Park is a short distance away and offers some excellent woodland walks, and Largs itself has plenty of history to keep your interest, and it's all on our doorstep. "We'll be delighted to take short-term or long-stay bookings and are open all year round except for Christmas and New Year. For a first-class holiday experience, contact us today. We have a select range of rooms at Broom Lodge to offer you. There is the spacious large double room with full ensuite facilities and TV, and we now offer Wi Fi connection as well.There is also a second double room which has full ensuite facilities. We also have a twin room, again with full ensuite facilities and TV, and also 2 single rooms with private facilities and TV, and our room prices start from as little as £30 for a single room B&B and £55 for a double room B&B. Please get in touch with us to obtain an exact price for your choice of room. All rooms are heated throughout and we're glad to welcome children. We can also accept pets by arrangement.